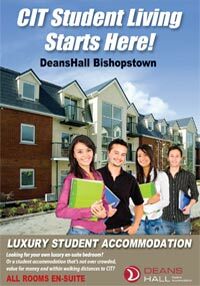 DeansHall has over 20 years experience in Student Accommodation and are one of the leading student accommodation centres in Cork City. DeansHall is an ideal place to live if you wish to pursue your academic life in Cork City or Bishopstown. We have a helpful and friendly management team on site to assist with any queries you may have, so please feel free to call in to the office where there is always someone there to help. We also have a team of expert caretakers on site to deal with any maintenance queries. We also have a security guard/help desk available from 9 pm – 4 am. They are equipped to deal with the majority of maintenance issues that may arise during your stay and help provide a safe and secure environment for all of our residents. Please contact reception by emailing info@deanshall.com or call us on +353 (0)21 4312623 (Crosses Green) or +353 (0)21 4819500 (Bishopstown). Our student accommodation complexes are located in Crosses Green, Cork City Centre and on the Curraheen Road, Bishopstown Cork. Error: Error validating access token: Session has expired on Saturday, 13-Oct-18 08:58:49 PDT. The current time is Wednesday, 24-Apr-19 20:59:55 PDT.